There are currently 168 people online. 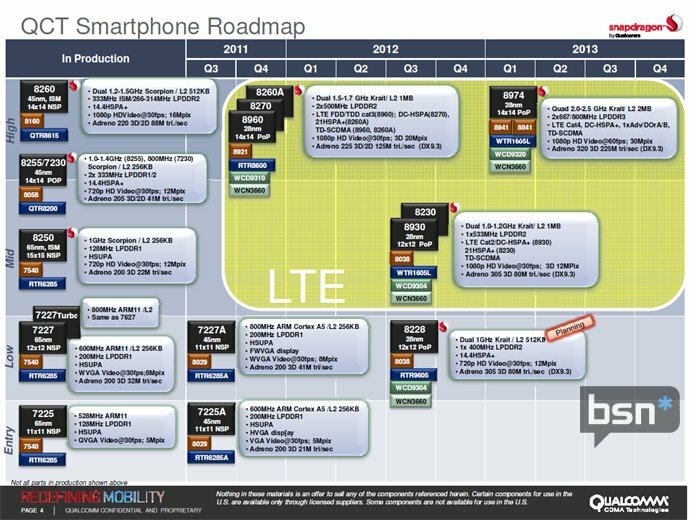 Bright Side of News has an update about Qualcomm's chip roadmap, you can read it over here. Qualcomm announced its Snapdragon S4 class of processors and their first offering is the MSM8960 chip with an Adreno 225 GPU. The five processor SoC will include an integrated modem on die. The 28nm SoC's micro-architecture is based on up to four independent ARM Cortex-A15 CPU cores, plus a 32 core GPU, a 128-bit SIMD engine, three DSPs, and hardwired codecs all running initially at 1.5GHz which will scale to 2.5GHz.